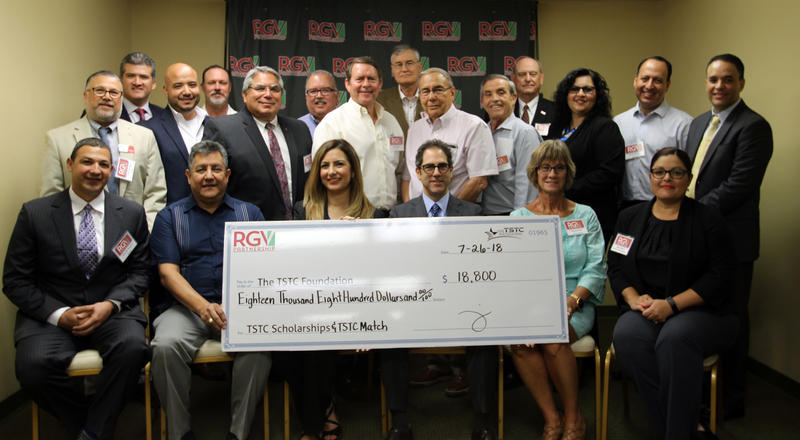 (HARLINGEN) – The Rio Grande Valley Partnership recently presented Texas State Technical College in Harlingen with a donation in the amount of $18,800 for the Texan Success Scholarship fund to be used for Vocational Nursing and Registered Nursing scholarships. 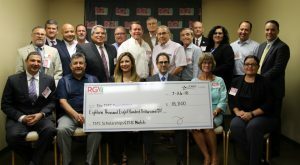 The initial donation was $9,400 and was matched dollar-for-dollar by TSTC’s Foundation and came from an endowment that the RGV Partnership started in 2014. Brent Baldree, RGV Partnership Foundation chairman and chief lending officer and South Texas regional market president at Texas Regional Bank, said the endowment was first started as part of the foundation’s mission to promote education in the four counties of the Rio Grande Valley: Starr, Hidalgo, Cameron and Willacy. “We have a long-time partnership with TSTC and they have always provided our workforce with quality graduates and it’s important that we continue assisting with their mission,” said Baldree. Baldree added that since the inception of the RGV Partnership Foundation they have contributed nearly $160,000 to post-secondary institutions Valley wide. A financial endowment is a donation of money to a non-profit organization and is designed to keep the principal amount intact while using the interest collected over time for charitable efforts such as scholarships. In this case, RGV Partnership wanted nursing students to be able to use this money for tuition, room and board or books sooner rather than later and decided to move the monies to the TSTC Texan Success Scholarship Fund. And with the reintroduction of the Vocational Nursing to Registered Nursing transition program it was agreed that this was perfect timing. First-time TSTC students who are enrolled in vocational and registered nursing are eligible to apply for the scholarship. Those who are awarded will receive $1,000 for the year; $500 for the Fall Semester and $500 for the Spring Semester. TSTC Provost Cledia Hernandez said with the demand for nurses increasing these scholarships will help fill a gap. Already, with this donation, five nursing students have been awarded a Texan Success Scholarship for the Fall 2018 Semester. To date, the Texan Success Scholarship has helped more than 660 students statewide and TSTC Foundation has raised more than $746,000. For more information on how you or your company can give to fund student scholarships, call TSTC Foundation at 956-364-4500.